After shakedown and visits to New York and Philadelphia, Lake Champlain was assigned to "Magic Carpet" duty, departed Norfolk for England 14 October 1945, and arrived Southampton the 19th where she embarked veterans and returned them to New York. Lake Champlain retired to the "Mothball Fleet" at Norfolk, Va., 17 February 1947. After the United States had allowed her active military strength to shrink to the danger point, the Communists struck in Korea. Fortunately, the U. S. had ships in reserve, though it took time to obtain and train crews and provide materiel. Lake Champlain was reactivated and modernized at Newport News Shipbuilding and Drydock Co., and recommissioned 19 September 1952, Capt. G. T. Mundroff in command. After shakedown in Cuban and Haitian waters, 25 November through 25 December 1952, the carrier departed Mayport, Fla., for Korea 26 April 1953 via the Red Sea, Indian Ocean, and China Sea, becoming the largest ship to transit the Suez Canal up to that time. She moored at Yokosuka, Japan, 9 June 1953. As flagship of Carrier Task Force 77, she sailed from Yokosuka 11 June 1953 and arrived off western Korea 14 June. The carrier's air group immediately launched sorties cratering runways; assaulting enemy troops; attacking trenches, bunkers, gun positions; and giving close air support to hard pressed ground forces. Her planes also escorted B-29 bombers on their way to enemy targets. Lake Champlain continued to strike at the enemy until the truce was signed 27 July. Relieved by USS Kearsarge (CVA- 33) 11 October 1953, Lake Champlain headed toward the South China Sea arriving Singapore 24 October. Bidding farewell to the Pacific Ocean 27 October, she steamed toward home touching at Columbo, Port Said, Cannes, and Lisbon before arriving Mayport, Fla., 4 December 1953. In the years that followed, Lake Champlain made several cruises to the Mediterranean, participating with NATO forces. On 25 April 1957 she joined elements of the fleet in a high-speed run to the scene of tension in the Middle East, cruising in the vicinity of Lebanon and backing Jordan's stand against the threat of Communism. The swift and firm reaction averted a near catastrophe in the Middle East. Tension eased and Lake Champlain returned to Mayport 27 July. Converted to an antisubmarine carrier and reclassified (CVS-39) on 1 August 1957, Lake Champlain trained off the eastern seaboard to master her new role. She departed Bayonne, N.J., 8 February 1958 for a Mediterranean cruise. While in the Mediterranean, she arrived 16 October 1957 at Valencia, Spain, and provided aid to thousands made homeless by a flood. Lake Champlain returned 30 October to Mayport, Fla. After yard overhaul, she again departed for the Mediterranean 10 June 1958 and visited Spain, Denmark, and Scotland, before returning to Mayport 9 August. 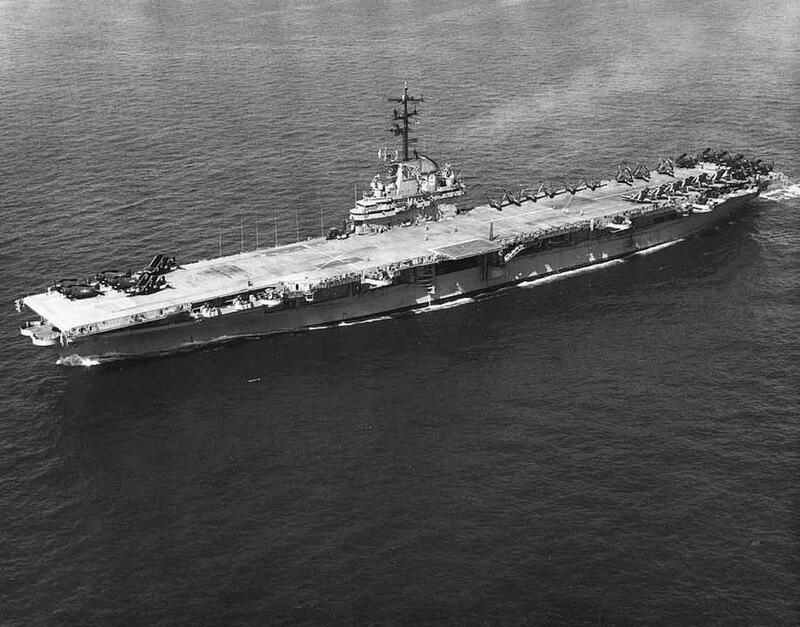 The carrier operated off Florida and in the Caribbean until 15 June 1958 when she sailed on another Mediterranean cruise returning to her newly assigned homeport, Quonset Point, R.I., 4 September. The carrier operated out of Quonset Point, R.I., until 29 June 1960 when she made a midshipmen cruise to Halifax, returning 12 August. Beginning 7 February 1961, she made a cruise to the Caribbean, returning 2 March. Lake Champlain was selected as the prime recovery ship for the first manned space flight. She sailed for the recovery area 1 May 1961, and was on station on 5 May when Cmdr. Alan Sheppard splashed down in spacecraft Freedom 7, some 300 miles down range from Cape Kennedy. Helicopters from the carrier visually followed the descent of the capsule and were over the astronaut two minutes after the impact. They skillfully recovered Astronaut Sheppard and Freedom 7 and carried them safely to Lake Champlain's flight deck. For the next year the ship operated along the Atlantic coast and in the Caribbean. In June 1962, she embarked Naval Academy midshipmen for a summer cruise to Halifax, Nova Scotia, and Kingston, Jamaica, where she represented the United States at the island's celebration of its independence, 3 August. On 24 October 1962, Lake Champlain joined in a classic exercise of sea power — -the quarantine of Cuba, where the Soviet Union was constructing bases for offensive missiles. To block this grave threat, U.S. warships deployed throughout the western Atlantic, choking off the flow of military supplies to Cuba and enforcing American demands for the withdrawal of the Russian offensive missiles. After the American demands were substantially complied with, Lake Champlain sailed for home 23 November, via St. Thomas, Virgin Islands, and arrived Quonset Point, 4 December 1962. For the next few months the carrier was in New England waters for operations and overhaul. In mid-October 1963, four Navy ships, including Lake Champlain and the amphibious assault ship USS Thetis Bay (LPH 6), aided by Navy and Marine Corps cargo aircraft from east coast stations, delivered nearly 375 tons of food, clothing and medical supplies donated by relief agencies to the people of Haiti after that country was devastated by Hurricane Flora. Lake Champlain returned to Quonset Point 9 November 1963 for operations in New England waters. She visited Bermuda briefly in spring of 1964 and steamed to Spain in the fall for landings near Huelva. She sailed 6 November from Barcelona for the United States, touched at Gibraltar and arrived at Quonset Point 25 November 1964..
On 19 January 1965, Lake Champlain recovered an unmanned Project Gemini space capsule launched from Cape Kennedy, Fla., after a suborbital flight 1,879 miles down the Atlantic Missile Range and to within 16 miles of the carrier. The last major duty of her career occurred on 5 August 1965 when she served as the primary recovery ship for Gemini 5. Gemini 5 splashed down into the Atlantic 90 miles off target after a record-breaking eight-day space flight, and 45 minutes later, Navy frogmen helped astronauts Gordon Cooper and Charles Conrad out of their space capsule and aboard a helicopter for the ride back to Lake Champlain. Soon after this duty was completed, she sailed to Philadelphia, where she commenced inactivation. She was decommissioned 2 May 1966. The 24-year-old Lake Champlain was stricken from the Navy List on 1 December 1969, and sold by the Defense Reutilization and Marketing Service (DRMS) for scrapping on 28 April 1972.